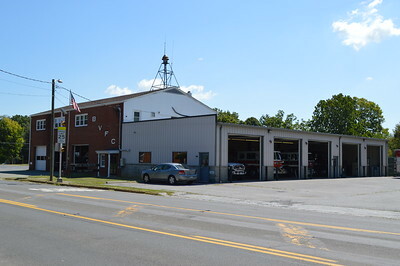 Boyce, Virginia - Clarke County Station 4. 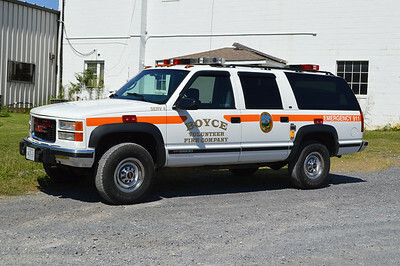 The Boyce Volunteer Fire Company - Clarke County Station 4. 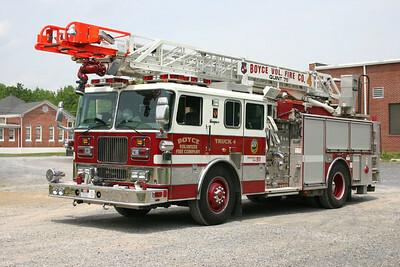 Boyce's Engine 4 is this 1991 Seagrave JB70DH 2000/1000, sn-Y78316. Engine 4 is set up as a supply engine. 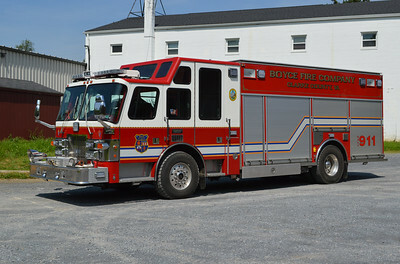 In 2016, Boyce Squad 4 received a complete "lighting" upgrade including a new light bar and LED lights around the entire truck. Squad 4 is a 1997 Simon-Duplex/Saulsbury 250/250 with Saulsbury serial number 295141. It originally was delivered to Goshen, PA and Boyce received it in 2009. 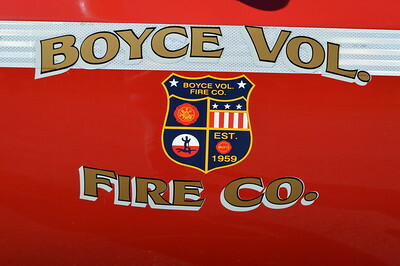 The Boyce house siren, and the towns water tower in the background of Squad 4. Boyce's Squad 4 taken at the Winchester Apple Blossom Parade in 2015. Tanker 4 is a 2006 Mack Granite/2007 Firovac, 1000/3700. Officer side of Tanker 4. 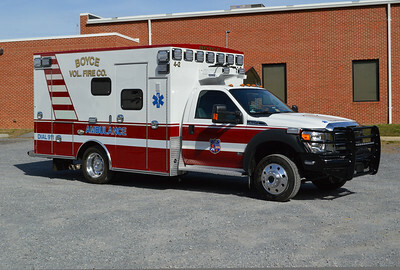 Ambulance 4-1 is a 2006 Ford F-450/Horton. 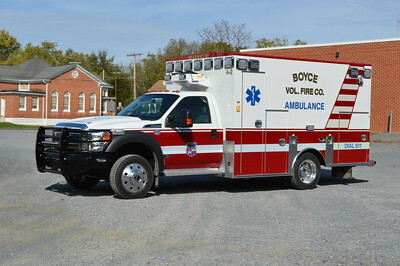 Photographed shortly before going into service in October of 2016 is Boyce's Ambulance 4-2, a 2015 Ford F450/2016 Braun. 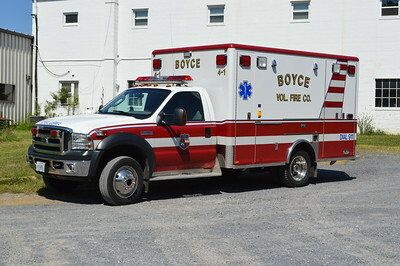 An officer side view of Boyce's "4-2", a 2015 Ford F450/2016 Braun. 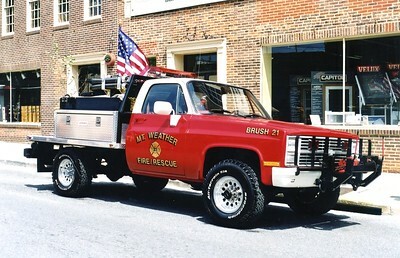 SERV 4 is a 1997 GMC. 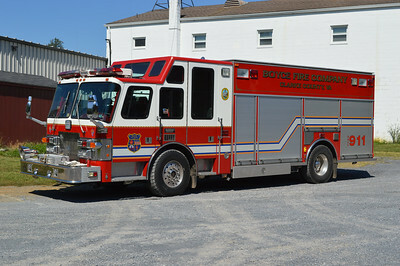 Wagon 4 from Boyce is this nice 1987 Seagrave HB50DH 1500/500, sn T79709. Delmarva rehabbed this engine in 1996. 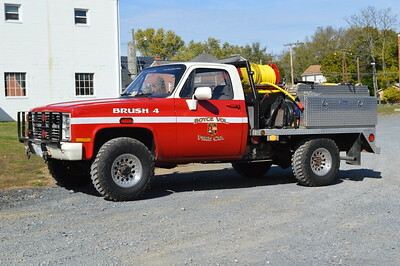 Wagon 4 was purchased from the Friendship Fire Co. in Winchester, VA. Sold back to Friendship in 2017. 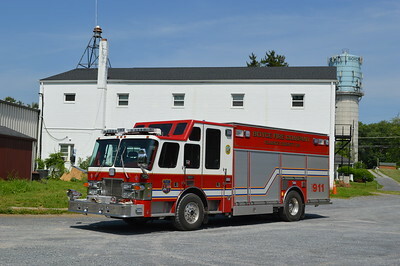 Wagon 4 with the station's house siren in the background. 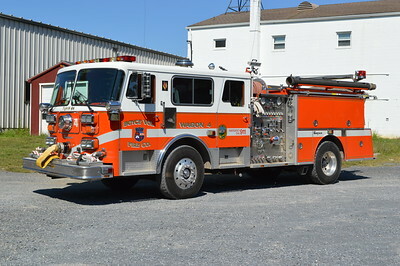 In September of 2017, the Friendship Fire Company of Winchester, Virginia received its old Seagrave engine back. 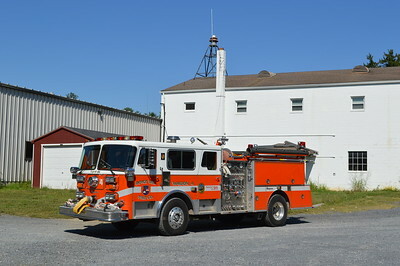 This 1987 Seagrave HB50DH was originally delivered to Friendship. 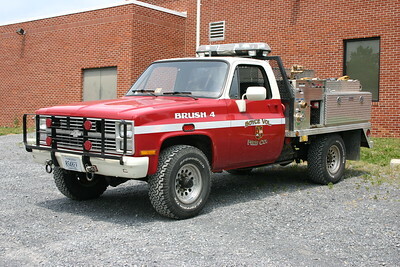 In 1996, Delmarva completed a rehab on the Seagrave to include a 4 door cab enclosure. 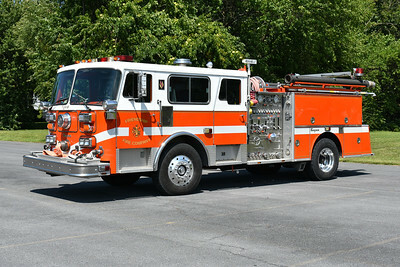 Equipped as a 1500/500 and Seagrave serial number T-79709. 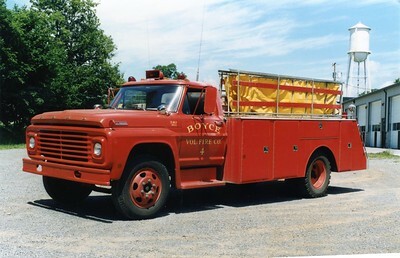 In approximately 2003, the Seagrave was sold to nearby Boyce, Virginia in Clarke County. 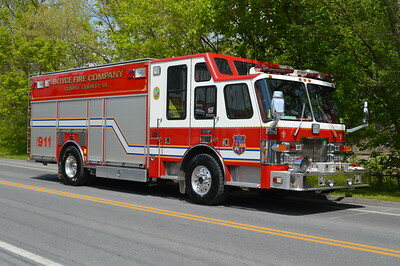 Friendship purchased the Seagrave back in 2017 and placed it into service as Reserve Engine 1. 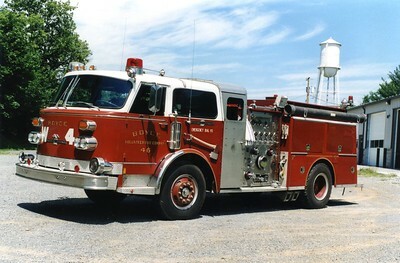 Former Wagon 4, a 1979 American LaFrance/1992 FD, 1500/750, sn- CE146309. Sold to Moodyville, Tennessee (Fentress County). 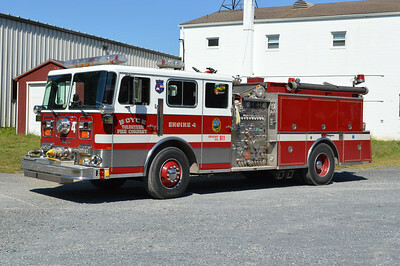 Former Truck 4, a 1999 Seagrave, 1500/500, 75'. 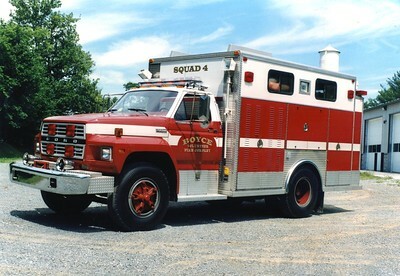 Former Squad 4, a 1982 Ford F700/EVF. ex - Falmouth, Virginia (Stafford County) ex - Round Hill, Virginia (Frederick County). 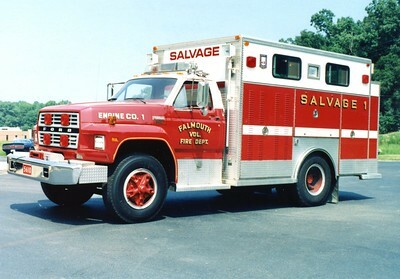 Salvage 1 was a 1983 Ford/EVF. Sold to Round Hill, Virginia (Frederick County). Sold to Boyce, Virginia (Clarke County). 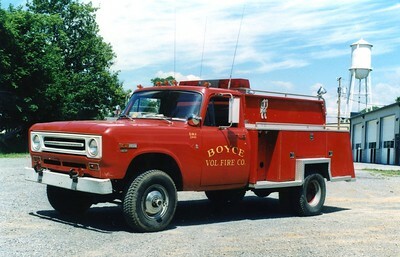 Former Tanker 4, a 1980 Ford C/Altec, 500/2200/300. ex - Bedington, West Virginia. Sold to a private owner in 2006. 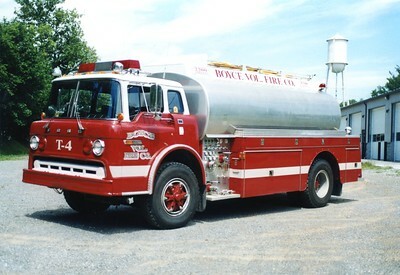 Former Reserve Tanker 4, a 1967 Ford 600/Broadway Metals, 250/1100. 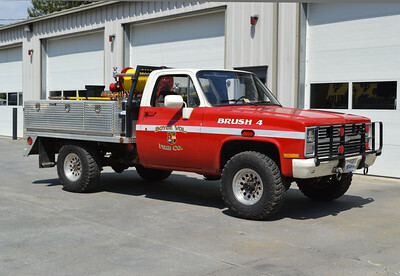 Former Brush 4, a nice 1970 International/Broadway Metals, 250/350. 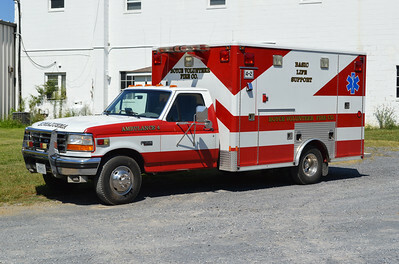 Ambulance 4-2 is this 1995 Ford F-350/Emergency One. It was purchased from Alexandria, Virginia. For sale in late 2016.